I read this article and found it very interesting, thought it might be something for you. The article is called To Train Million Indians A Week, Skill India Needs Wider Net and is located at https://archive.indiaspend.com/cover-story/to-train-million-indians-a-week-skill-india-needs-wider-net-38623. Prime Minister Narendra Modi has thrown his weight behind the comprehensive National Policy for Skills Development and Entrepreneurship, launched in the summer along with several new schemes as part of the Skill India initiative. The plan, massively ambitious in scale, aims to train over 40 crore Indians by 2022, which equates to approximately one million people per week! For perspective: only 7 million Indians were trained in 2014, and the National Sample Survey shows that as of 2012, fewer than 5% of all Indians had ever received formal skills training. To succeed, this plan must identify and target eligible youth with a desire for skills training. However, it is not clear that current recruitment strategies cast a wide enough net to reach these hefty goals. How can evidence help ramp up India’s skilling efforts? And how to ensure that the populations who are most interested in skilling, and can potentially benefit the most, are reached? At Evidence for Policy Design, we have asked just these questions. We analysed 2011-2012 National Sample Survey (NSS) data, and combined our analysis with insights gleaned from conversations with training agencies, government partners, and potential and former trainees. From this, we have identified three empirical insights to focus the new policy’s efforts on high priority and high-potential populations. First: who benefits from skills training? Everyone, but particularly women, and youth with lower initial education levels. Studies in other countries show positive impacts of skilling on employment outcomes, particularly for women. While we lack causal evidence for India, the table below shows that vocational training is correlated with higher labour force participation. Regardless of an individual’s education level, labour force participation is higher for those with skilling, and the difference appears quite strong for those with middling education levels overall. Those who have completed vocational training are also more likely to participate in semi-skilled occupations than unskilled occupations – and this relationship appears to be strongest for those with lower education levels. And in terms of gender, labour force participation is 30% higher for women who have completed skills training, as compared to only a 16% difference for men. While all this is not evidence that skilling causes these changes, it establishes an important correlation between skills training and increased labour force participation. Second: who should skilling target? The short answer is, once again, middle-educated youth and women. While labour force participation rates are low across the board for 18-35 year olds, youth with 11th or 12th pass education are the least likely to be in the labour force (see graph above). Given that 42% of young adults (age 18-35) have 9th or 10th pass education, while only 27% having 11th or 12th pass, skilling programs could significantly increase their target population by ensuring that youth who just missed graduating from higher secondary school are not passed over. Furthermore, women participate in the labour force at strikingly lower rates than men: only 23% of women aged 18-35 are active members of the labour force, compared to 83% of men. And women with secondary education are even less active, with only 15% of these women in the labour force. 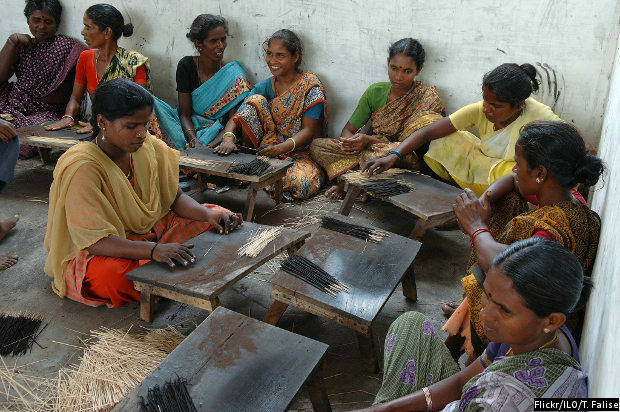 By contrast, illiterate and primary educated women participate in the labour force at almost twice that rate. But critically, data shows that a substantial fraction of these women want to work, and skilling may present an opportunity to connect women to jobs. Of the 70% of women not in the labour force who are primarily occupied with domestic work, over 30% say they would accept work if it were available. Crucially, half of these women say they don’t have the skills they need to participate in the workforce. The implications of this are substantial: not only would skilled women have greater economic access and independence, but the scope of domestic production possibilities would expand as a result of a larger labour force. Third: refocusing recruiting strategies under Skill India can yield high returns. Both the NSS data and our interactions with training agencies suggest that recruitment for skills training focuses on youth with at least a 12th pass education (and some trades require even higher education levels), and that men participate in training at a much higher rate than women. Yet the evidence we present here suggests that lower educated youth and women may have high demand for skilling while also enjoying relatively large benefits from skilling compared to other populations. Targeting these populations more aggressively could help the government get closer to achieving its skilling targets while simultaneously addressing clear challenges in labour force participation. Skilling programs should reconsider their current recruitment strategies and implement procedures that better mobilise these high-potential populations. If the government is going to make real progress toward its ambitious targets, a first step should be widening their target trainee population. Thanks to the Government for initiating such a great project of skill development. Nowadays people have certificates and degrees but when asked for doing some specific tasks they are not able to do it. So in such a skill crises scenario the proper implementation of this program is very crucial. For the success of this great initiative the facilitating agency as well as the trainee should have the great responsibility. They have to see that the quality of training should not degrade in any instance. The trainee should take it very seriously because they are giving their time at the same time Government is paying for their training fees.